The East Coast is being hit with yet another blizzard today. Snow days, boots, heavy coats, and less productivity are on tap. What’s on your agenda today? This past week has been positive, productive and absolutely rocked. when I have good days I wake up the next morning and ask myself “How will I top yesterday.” Tell me, how will you top yesterday? 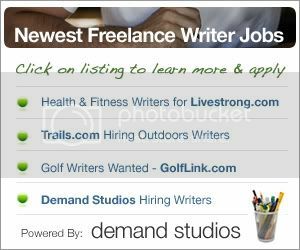 Your Turn: What Makes a Qualified Freelance Writing Blogger? I’m really trying to weed out the bad stuff and hope it’s showing. That’s why there’s such a short list today. Well that and there’s not much going on in the freelance writing jobs world. How did I top yesterday??? I got talk to my twin daughters classmates about what my career is. I loved it! What a big toppper! Thank you for letting me share the great news! Enjoy the blizzards…isn’t in fun living on the East Coast? My kids will be going to school til the end of June! At this point, all I can think is tomorrow’s another day. After filing taxes weeks ago, I got an email from one company stating they made mistakes on all of their 1099s and were mailing new ones out tomorrow. I’ve never had to file an amended tax return and can’t say I’m thrilled to have to do this now. I am so busy with so much work and creativity. My days just flow to the next. I started tweeting and that’s an interesting undertaking. I haven’t grasped it fully. But I look forward to the day I do. Unexpected “stuff” comes up on my days because I’m involved in so many activites, handling them flawlessly is pure joy and makes my day.